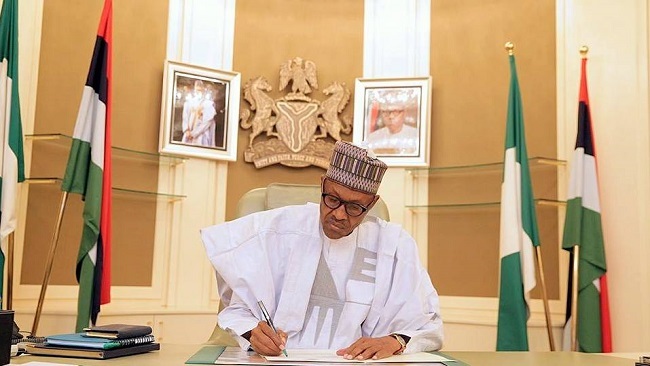 Nigeria’s President Muhammadu Buhari announced on Monday he wants to seek another term in office in February 2019 elections. With that declaration, the race to lead Africa’s largest democracy is underway. The path ahead could be tough for his All Progressives Congress (APC), the People’s Democratic Party (PDP) opposition and any other party that may contest the vote. The results have been mixed. He has not brought an end to the war with the Boko Haram insurgency, now in its 10th year. The economy entered and climbed out of recession under Buhari, yet the average Nigerian is still getting poorer; and opponents say his administration is failing to tackle endemic corruption, targeting only the President’s enemies and ignoring allegations against his allies. After spending five months in Britain last year being treated for an undisclosed ailment, Opposition groups and other critics said he was unfit for office and his administration was beset by inertia. If Buhari wins again, his opponents say, Nigeria would be in for another four years of political torpor. On the other hand, the President’s supporters say the opposition has little to offer beyond “Not Buhari” – a sign ofNigeria’s personality-driven politics. Nigeria is deeply divided. One of the most fundamental rifts is between the mainly Muslim north and the largely Christian south, and the population is fairly evenly split between the religions. Africa’s most populous country also has more than 200 ethnic groups, with the three largest the Hausa in the north, the Yoruba in the southwest and the Igbo in the south-east. That has led to an unofficial power-sharing agreement among Nigeria’s political elite. The presidency, in theory, is to alternate between the north and south after every two four-year terms. Buhari, a northern Muslim, has held the post since 2015. His predecessor, the PDP’s Goodluck Jonathan, is a southern Christian. In keeping with the accord, the PDP is set to select a northerner as its candidate for 2019. Those divisions play into what could be one of the major issues of the 2019 elections: deadly violence between mostly Christian farmers and mainly Muslim nomadic herders that has broken out in the Nigerian hinterland states known as the Middle Belt. Buhari’s critics say he is soft-peddling justice for the killings because he, like most of the herders, is from the Fulani ethnic group and is Muslim. The presidency denies that criticism, which also largely ignores the fact that there have been deaths in both communities as a cycle of reprisal attacks shows little sign of ending. This could turn the Middle Belt, much of which voted for Buhari in 2015, into some of the most crucial swing states next year. With a booming young population, Nigeria’s median age is just 18, according to the United Nations. Many youth see Nigeria’s ageing leaders as out of touch. Buhari, 75, is the oldest person to helm Nigeria since the transition to civilian government in 1999. That has sparked ‘Not Too Young to Run’ campaigns to allow younger people to seek office. Nigeria’s former military leaders retain a strong influence over politics nearly two decades after the advent of civilian rule. Buhari himself is a retired general who was head of state from 1983-1985. Other military-era chiefs continue to wield political leverage, including the likes of Olusegun Obasanjo, who led the country in the 1970s and was President from 1999-2007, and Ibrahim Babangida, who ruled from 1985-1993. The two main parties, the ruling APC and opposition PDP, do not have clear ideological differences. Competition for control of national oil revenues by elites, patronage and complex rivalries between Nigeria’s hundreds of ethnic groups have played a much bigger role in elections than ideology. The APC is the latest incarnation of the various vehicles Buhari used to run in 2003, 2007 and 2011. His eventual victory in the last race came after assembling a broad coalition across the north and southwest. Without Buhari, political insiders say, there would be no APC. The PDP was the inheritor of decades of military rule in 1999, and held power until Jonathan’s defeat in 2015. Because of that, the party has traditionally appealed to Nigeria’s business community, which developed during the military regime. No clear candidate for the PDP has emerged. Some members see Atiku Abubakar, who has signalled he may run, as the best choice. A local tycoon and former Vice President for the PDP under Obasanjo, he has made numerous unsuccessful bids to become Nigeria’s leader. Abubakar became a key ally and funder of Buhari during the 2015 campaign, only to once again switch sides late last year and indicate his desire to contest again. It is also possible that a third major party may form, with rumours swirling of potential powerful backers including Obasanjo and Babangida. Facebook’s Cambridge Analytica scandal has hit Nigeria. The government has launched an investigation into allegations that the firm was hired to interfere with Buhari’s campaigns in 2011 and 2015, on behalf of the PDP and then-President Goodluck Jonathan. Jonathan, through a spokesman, denied any knowledge of the alleged interference. Cambridge Analytica has not commented on the allegations. Voter turnout in the 2015 election was 29.4 million, or 44 per cent of registered voters, according to Independent National Electoral Commission data. Party primaries run from August 18 to October 7. Campaigning will be held from Nov. 18, 2018 to Feb. 14, 2019, and the presidential elections are set for Feb. 16, 2019. The candidate with the most votes is declared winner as long as they have at least one-quarter of the vote in two-thirds of Nigeria’s 36 states and the capital. Otherwise there is a run-off.